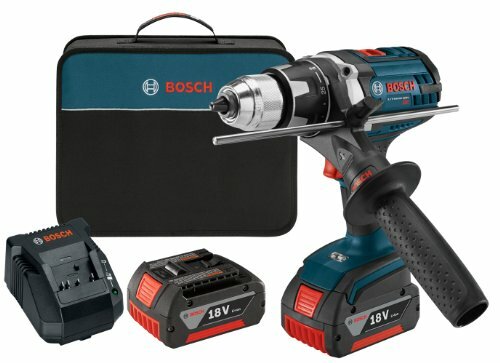 The Bosch DDH181X 18-Volt Brute Tough Drill/Driver now features Active Response Technology, an industry first that reduces the risk of dangerous kickback during high torque applications without compromising performance. Active Response Technology uses electronic motor control to reduce the risk of harmful torque reactions in bind-up situations. An integrated acceleration sensor limits the tool's rotation by detecting sudden movements and cutting off the motor to stop the tool. Feel more in control with the redesigned auxiliary handle. This handle is longer than previous versions and adjustable to 23 positions without having to remove it from the tool. A tongue-and-groove locking structure helps prevent slipping and increases control during use, while the 1/2-Inch metal chuck delivers a high clamping force. Tackle even the toughest drilling and driving applications with 700 in-lbs of torque from the 4-pole open frame motor. Select between 2 speeds and 25 clutch settings to optimize available torque for precise screw driving and improved drilling speed. Built to be Brute Tough, the DDH181X features exclusive Durashield housing and an all metal gearbox and is capable of surviving 25 drops from 12 feet high onto solid concrete. Bosch electronic motor and cell protection help prevent overheating and overloading - which extends tool life, runtime, and increases battery lifetime by more than 400%. 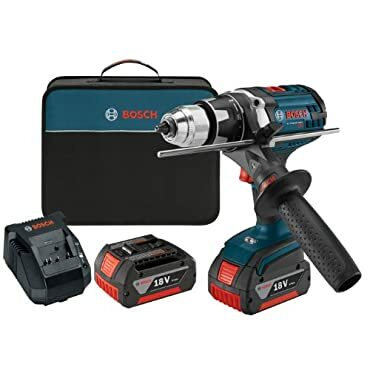 For optimum results, pair this tool with Bosch's next generation BAT620 4.0 Ah or BAT612 2.0 Ah 18-Volt lithium-ion batteries, which combine greater cell energy density for up to 65 percent longer runtime and advanced CoolPack technology for up to 100 percent more recharge-life. The DDH181X-01 includes two 18-Volt 4.0Ah batteries, a belt clip and a charger. Bosch 18V Li-Ion 1 / 2 in. Brute Tough Drill Driver Kit DDH181X-01-RT Recon -- Authorized Seller. Full Warranty. Money Back Guarantee. Last updated: April 20, 2019 at 12:04 EST. Pricing information is provided by the listed merchants. GoSale.com is not responsible for the accuracy of pricing information, product information or the images provided. Product prices and availability is subject to change. Any price and availability information displayed on amazon.com or other merchants at the time of purchase will apply to the purchase of the product. As always, be sure to visit the merchant's site to review and verify product information, price, and shipping costs. GoSale.com is not responsible for the content and opinions contained in customer submitted reviews.